Within the last 20 years, the emergence of computer technology has transformed the working world and made e-skills a requirement for the majority of jobs that pay a good wage. Unfortunately, in many countries, the requirements for computer and technology skills in new jobs exceeds the training and experience that most workers have, creating a digital divide that has serious economic impact. As new business opportunities arise from information technology development, there is a corresponding increase in the isolation of those without technology skills, putting them at a considerable disadvantage in the job market. In Russia, the number of computers is growing at the highest rate in the world and the online audience is the fastest growing in Europe - yet only 35 % of the population use computers and 29% use the Internet. Among those using the Internet, the majority live in the biggest cities with populations over 500 thousand people, are aged 25-34 and have above average income. While the Russian government is committed to providing the necessary infrastructure for Internet connections on a national level, a federal program for technology skills training is yet to be developed, and the approaches to address this issue vary in every region. Given low incomes and priorities to fulfill basic needs in feeding and clothing the families, a considerable proportion of the population still cannot afford personal computers, licensed software, and IT training. Free, community-based ICT Centers can address this problem directly, offering open access to computers and job-specific training that will ultimately have a positive impact on marketability and employability, lessening the digital divide. Over the past decade, community-based ICT centers have been launched and developed in many Russian cities. Organized in collaboration with municipalities and regional governments, businesses and non-governmental organizations, they have taken the first steps toward providing universal access to IT training and resources. At the beginning of the community technology training movement in 1999, Project Harmony, a non-for-profit organization with a 20-year history of building strong communities by fostering civic leadership, harnessing information technology, and facilitating cross-cultural experiential learning, led the Internet Access and Training Program (IATP), an initiative of the Bureau of Educational and Cultural Affairs of the US Department of State. Over the next six years, 106 internet access centers were opened throughout Russia in libraries, universities, and other non-profits, and over 338,000 people learned e-skills and how to access information via the Internet. In 2006, forty centers began to build on these basic services when they joined Project Harmony�s Information Dissemination and Equal Access (IDEA) Project, supported by the Microsoft Unlimited Potential - Community Technology Skills Program. 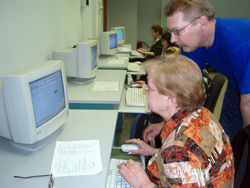 Running strong today with 59 centers, IDEA provides training in basic and job-related computer skills and maintains the goal of increasing employment and marketability among underserved and disadvantaged populations in Russia. IDEA also works to encourage citizen participation in civic engagement projects and increase the capacity of citizens to address local problems. 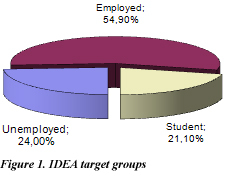 Every month, IDEA centers provide at least 40 hours of free Internet access to the public and 26 hours of free training: 16 hours of core training in Unlimited Potential Curriculum, developed by Microsoft specialists, and 10 hours are workshops and trainings in capacity-building topics to best suit the target population in the specific community, such as How to Build a Successful Resume, Job Search on the Internet, Preparing for the Interview, as well as trainings in specific application of technology. Upon successful completion of the course, participants receive a certificate from Microsoft Unlimited Potential attesting to their new skills � a certificate which, in itself, increases the job opportunities for center graduates. Twenty-four percent of IDEA participants are unemployed and retired when they sign up for courses, another 55 % are low-income persons seeking to change their work and the remaining 21% are socially disadvantaged students. The majority of unemployed participants are referred by local employment agencies because they cannot locate appropriate services that meet their job training needs. As of July 25, 2008, 12,032 persons were trained in Microsoft Unlimited Potential curriculum, 26,767 others participated in short-term courses, workshops and seminars, and over 191,300 people have used the services of Russian IDEA centers. Of these trainees, 14% are people with disabilities who in most cases require extra individual consultations and adjusted curriculum which is not possible within the regular course settings. IDEA Centers are community-based projects, drawing on the networks and resources of many regional leaders. Each center is launched in partnership with libraries, universities and other non-profits with the support of regional and municipal authorities. Host institutions contribute substantial resources to the program, ensuring the long-term financial viability of the centers: facilities, equipment, connectivity, technical support, trainers for the seminars and a coordinator. Project Harmony specifically requires the commitment of local partners to securing a significant cost share, and this has proven critical to building centers into communities for the long-term. This takes public-private partnerships, as well as the support of local governments, to cover expenses such as the Internet connection, building upgrades, and more. When this commitment from local businesses and public officials is in place, such centers can become dependable hubs of lifelong learning. Currently the project encompasses a network of 58 centers: 32 centers receive financial support from the project to pay trainers, and 26 others are volunteer centers which serve as a proof for the project�s relevance and the overwhelming need for its services. To reach out to target groups and facilitate employment and professional growth, IDEA centers work in collaboration with local employment agencies, social service centers, municipalities and NGOs. Such partnerships promote better understanding of needs, unite resources, and enrich each organization�s capacity to help underserved groups. Partnering with organizations that best represent target groups and participation in local activities helps to assure successful outreach efforts. The impact that IDEA courses have on trainees is tremendous � access to information, securing a job in an office environment instead of manual labor, opportunities for education and career growth, and more. In effect, this creates self-sufficiency and a higher standard of living. You have no idea how helpful the IDEA course was for me! I only thought it would help me retain my old position, but once I passed my evaluation, my supervisors asked me to take some additional training in my field, and very soon I got a promotion. Ekaterina Chagina, Yuzhno-Sakhalinsk. Many thanks for increasing the general level of computer literacy! Knowledge of computer applications, skills of writing a good r�sum� and e-mail skills enable me to successfully present myself to potential employers. Alfia Gataoullina, Izhevsk. You gave me a new life! Valentina Azbukina, Petropavlovsk-Kamchatsky. Senior citizens often lack computer skills because the expense of learning is so high. IDEA Centers, however, make computer training possible. Their activities remind me of the work of illiteracy liquidation centers during the USSR and are deserving of our praise and respect. I would like to thank the teachers for their selfless, patient attitudes in working with our older population to teach computer fundamentals and Internet skills. Vladimir Popkov, Chelyabinsk. Project Harmony has surveyed participants to find that after the course, 89% note that newly gained IT skills will assist them in finding a new job, and 94% report that these skills will assist in their gaining a promotion. Over 800 success stories from all the centers, which are available on the project website, confirm these figures and demonstrate the unlimited opportunities which ICT skills present for people. Valentina Azbukina, a 56-year old retiree from Petropavlovsk-Kamchatsky, left her low-paying job as a night guard for a more prestigious typesetting job with a trade company. Bair Vandanov from Ulan-Ude is one of many IDEA graduates who now work for private individuals to type, format and print research papers, applications and other documents, providing significant supplements to family income and Anton Fomichev from Vologda started his own textile printing business. All this would have been impossible without e-skills. Some active community members realize that e-skills will help them promote their work and make it efficient. Others come to the Centers for personal reasons but the new knowledge and skills inspire them to serve the community and help others. Many IDEA graduates become frequent visitors of the centers and volunteer their time as assistant trainers at the Center where they received their own certification, helping friends and colleagues to master computers and using their new skills to write grants for local community programs or develop their own social projects. For example, Irina Vanyukova, a teacher from Khabarovsk with over 20 years of experience, had to retire due to loss of vision. After completing several computer courses she realized that she could be of great help to the visually impaired. She helped to develop the special training schedule, became the trainer at the IDEA Center and launched a special club for blind PC users. Olga Kobylkina from Vladimir is a retired math teacher who, after taking a course in the basics of web design, created a website on housing allowances in Vladimir. It became very popular among low-income citizens in the area, and had over 6,000 visits within the first 2 months as it contains all the needed information which was previously scattered through various resources and media. � Cross-sector collaboration: By bringing together NGOs, libraries, schools, businesses, and local government, IDEA Centers are not only technology training centers�they are community centers in every sense of the word. The IDEA project has been internationally recognized as a finalist in the Stockholm Challenge � Global Knowledge Partnership Awards 2007 and in the Stockholm Challenge 2008 for its significant contribution to ICT multi-stakeholder programs for social and economic development. Through IDEA Centers in Russia, e-skills are building local capacity. This can mean the personal capacity of the trainees to secure jobs, and it also means the capacity of local institutions to secure grant funding with newly trained volunteers capable of helping them. It can also mean increasing the capacity of organizations to meet the needs of the disabled through the use of special software. E-skills are also a catalyst. By bringing sometimes isolated towns and regions into contact with the Internet, they increase the sharing of experiences and methodologies, which energize community organizations and help them meet the needs of their clients in new, creative ways. IDEA centers� activities demonstrate the efficient collaboration between NGOs, government and businesses on the regional and local levels. However the small number of centers cannot possibly train all socially disadvantaged persons who need this training. A comprehensive investment from Russian federal authorities and national corporations would mean available training for thousands of Russians in need. Thanks to the success of IDEA Centers, the future of e-skills as a development tool in Russia has a roadmap to help show the way and a committed base of community support to build on. Khmelev, M. �All of Russia Will Have Internet and Phone Access�. Russian News and Information Agency Novosti. 24 March 2007 <http://en.rian.ru/analysis/20070324/62562246.html> 30 March 2008. �Russia Has Fastest Growing Internet Population in Europe. Press Release�. ComScore, Inc. 7 November 2007 <http://www.comscore.com/press/release.asp?press=1885> July 13 2008. �The Internet in Russia. 23rd Release. Spring 2008�. Public Opinion Foundation. 20 June 2008 <http://bd.fom.ru/report/map/int0802> July 13 2008. �IDEA Project Results�. Information Dissemination and Equal Access (IDEA) Project. <http://www.idea-russia.ru/summary/eng/ > July 25 2008. 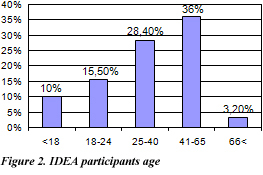 �IDEA Participants Survey�. Information Dissemination and Equal Access (IDEA) Project. <http://www.idea-russia.ru/idea/anketa/eng/> July 25 2008.